You can’t say he was vague about it. At this point, we couldn’t agree more. 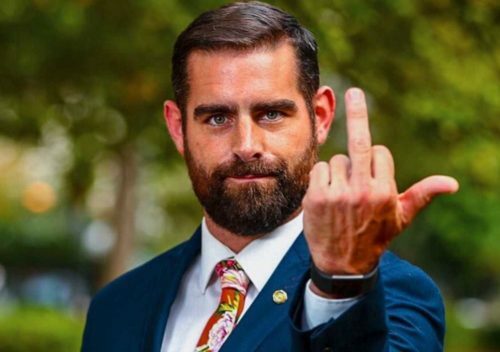 Pennsylvania State Rep. Brian Sims welcomed Vice President Mike Pence to his Tuesday fundraiser City of Brotherly Love — with his middle finger. The outspoken legislator lashed out at the vice president on Pence’s visit to Sims’ home district. “To be clear, we’re a city of soaring diversity,” Sims wrote on social media. “We believe in the power of all people to live and to contribute: black, brown, queer, trans, atheist, immigrant, we want you and we’ll respect you. Pence, so anti-LGBTQ that the Human Rights Campaign has a detailed guide to his bigotry, has drawn growing protests across the country. In Columbus, Ohio, last week, his visit was timed with Pride, no less, and a big block party blasted tunes outside the venue. In Philly, hundreds of protesters shamed Pence and the Trump administration for separating immigrant children from their families. Sims didn’t just flip him off and hide. He spent Tuesday afternoon and evening responding to — and debunking — the predictable replies to his post. If it’s a shock to see his dramatic approach, you’re not following Sims, now with 27,000 Twitter followers. Elected to the 182nd district of the Pennsylvania House of Representatives in 2012, the 39-year-old Democrat is a rising star in gay politics. On the one hand, he’s a former college football player who channels his inner Arial with a dashboard Disney rendition from “The Little Mermaid.” On the other, he’s unabashedly outspoken in calling out statehouse conservatives for religious bigotry. His smile, his beard, his robust stances on progressive issues make him the kind of guy with whom you’d pull up a chair, pop open a beer and watch the Philadelphia Eagles. But there’s a sliding scale on profanity, and as we slide further into Trump’s swamp, we see some substance to Sims’ sizzle, especially when we put it in local context. It’s his home. And, hey, it’s Philly.